India’s average age is 24 years, better than any other country in the world making the youth in India more than two thirds the population. The vibrancy, energy and exuberance of the Gen-Next sets the tone of the nightlife of every city. In the recent times, India has become popular for its nightlife that includes dining out, clubbing and entertainment. Nightlife in India is varied, from the biggest discotheques to well-known restaurants, from jazzy clubs to the trendiest malls, from caffeinated cafes to guzzling pubs. However what really makes a city a great party destination is not only the nightlife options available but also the spirit of the city that encourages one to party and live responsibly. India has quite a few party and nightlife destinations that are packed with notorious outing options. The diversity and liveliness of the big cities are reflected in its epic nightlife scene that most smaller cities and towns want to emulate. However, two cities that make up almost 80% of India’s nightlife are Goa and Mumbai. Goa: Undoubtedly India’s #1 party destination, Goa is synonymous with shores, sand and sundowners. Shake a leg at the in-house discotheques at the 5-star properties to the beach bonfire parties or gamble away at the casinos to have a great time. Pub hopping is something that most youngsters prefer to do all night long in a place like the Anjuna beach to get a taste of the authentic party culture. Mumbai: The party capital of the country, Mumbai has more than a fair share of amazing nightlife options. The Mumbai party scene is more or less similar to those in other bigger cities like New York, London and Bangkok. Throughout the night, the unsurpassed energy buzzes through the streets creating a playful chaos for pub crawling people with a plethora of bars and clubs. Other metro cities in India like Delhi, Bangalore, Jaipur, Chandigarh etc also have their fair share of night-hopping adventurous youngsters and it is easier to find an apt place to party when one visits the city. However, when one is in relatively smaller cities and towns it becomes a bit difficult to rely on word of mouth or references to step out at night and hence comes a handy a tool like PubFinder that lets you find a place depending on the mood you are in. There are options from party places to hang out places to places to relax or dine out. So whether you visit a metro city or a small town, every place has a variety of options to choose from. 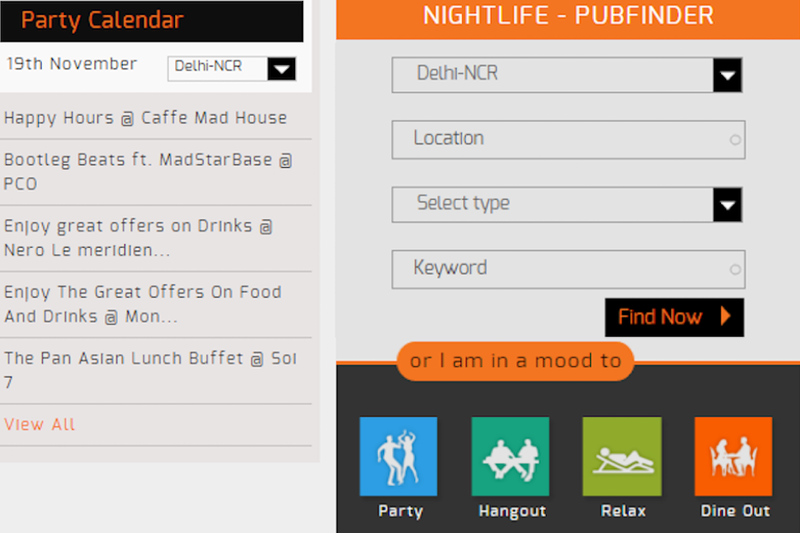 Browse the party calendar pick a place that lets you put your hair down and paint the town red.